Technical name in old English Treasury documents for the repository in which chirographs and other deeds were preserved. By the "Ordinances of the Jewry" in 1194 it was arranged that "all deeds, pledges, mortgages, lands, houses, rents, and possessions of the Jews should be registered"; that only at six or seven towns contracts could be made in duplicate, one part to remain with the Jewish creditor, the other to remain in the Archa; and that the contents of the archæ were there to be recorded on a roll of transcripts so that the king by this means should know every transaction made by any Jew in the kingdom. From time to time a "scrutiny" of the Archa took place, when either the Archa itself, or more probably the roll or transcript, was sent up to Westminster to be examined by the treasurer there. Many deeds showing copies of the rolls made at these "scrutinies" still exist at Westminster Abbey and at the record office (Memoranda, of the Queen's Remembrances—Jews' Rolls, Nos. 556 [3, 12], 557 [1, 7, 8, 10, 13-23]). 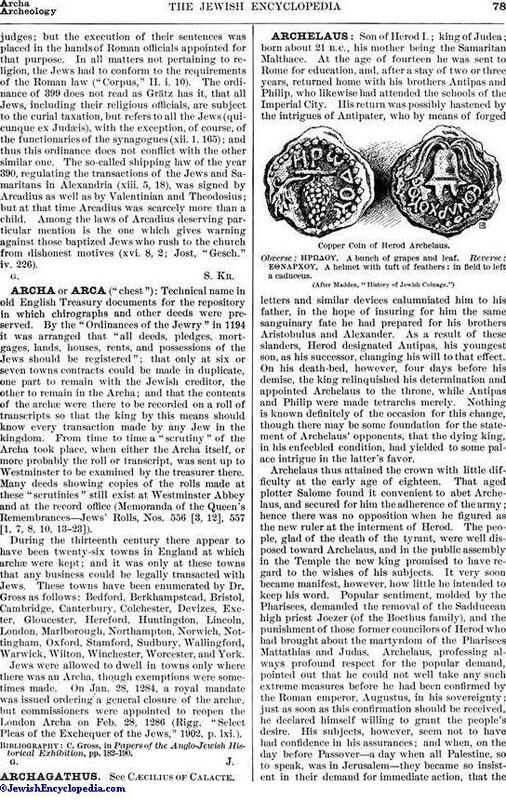 During the thirteenth century there appear to have been twenty-six towns in England at which archæ were kept; and it was only at these towns that any business could be legally transacted with Jews. These towns have been enumerated by Dr. Gross as follows: Bedford, Berkhampstead, Bristol, Cambridge, Canterbury, Colchester, Devizes, Exeter, Gloucester, Hereford, Huntingdon, Lincoln, London, Marlborough, Northampton, Norwich, Nottingham, Oxford, Stamford, Sudbury, Wallingford, Warwick, Wilton, Winchester, Worcester, and York. Jews were allowed to dwell in towns only where there was an Archa, though exemptions were sometimes made. On Jan. 28, 1284, a royal mandate was issued ordering a general closure of the archæ, but commissioners were appointed to reopen the London Archa on Feb. 28, 1286 (Rigg, "Select Pleas of the Exchequer of the Jews," 1902, p. lxi.). C. Gross, in Papers of the Anglo-Jewish Historical Exhibition, pp. 182-190.